A claustrophobic ‘closed room’ murder mystery set in the far North of Iceland permeated with feelings of loneliness and isolation. First book in the Dark Iceland series, focused on Ari Thor a recently graduated police officer in Iceland. Though the majority of the novel is about Ari’s investigation of the suspicious death of a local man at the theatre, Ari’s personal life and relationship with his girlfriend back in Reykjavik is also woven into the narrative. 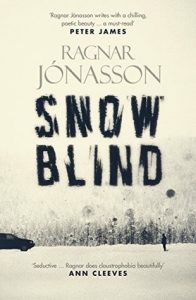 There is a balance between exploring the characters and revealing the clues, and there is more than one mystery in the tiny town of Siglufjordur. There are some beautiful descriptions, my favourite being blood on snow is described vividly as: “The red stain was like a scream in the silence”. Which is a credit to the translator, taking the original Icelandic and rendering it into English. The dislocation felt by Ari Thor after moving to the remote town is described as being: “like a traveller who had forgotten to buy a return ticket”. That sense of remaining day by day and not fitting in like a local, despite his prominent role as one of only 3 police officers in the town comes across so clearly that you can feel his distance from all those around him. But occasionally the translation feels clunky and the tension forced. One passage that really missed the mark for me was: “This peaceful little town was being compressed by the snow, no longer a familiar winter embrace but a threat like never before. The white was no longer pure, but tinged blood red. One thing was certain. Tonight people would lock their doors.” Sections like this weren’t enough to draw me away from the investigation, and I was swept up in Ari Thor’s world. As is my preference in crime novels, there was not a huge focus on police procedures. As the setting is a very small town, and for more of the novel it is completely cut off from the rest of the country by heavy snowfall, there is little in the way of police-station politics or wrangling of rules and regulations. If you love procedural, CSI or courtroom drama you won’t get any of that from this novel, which suited me perfectly!